The Red Bulls lost a heartbreaker to Orlando City SC, 4-3, on the road on Saturday afternoon. The Red Bulls fell to 2-2-0, 6 points in MLS play this season, while Orlando City SC earned their first win, and is now 1-2-1 with 4 points on Saturday afternoon. In the seventh minute, the Red Bulls got on the board when Florian Valot scored his first MLS goal when he headed in a brilliant cross from Kaku to make it 1-0. Kaku now has three assists in three MLS games, and also has a goal in the Scotiabank Concacaf Champions League. Valot, who earned an MLS contract this offseason after spending time with NYRB II in the United Soccer League, also earned his first MLS assist on the Red Bulls second goal. Orlando City tied it in the 15th minute when Will Johnson scored on a feed from ex-Red Bull Sacha Kljestan and Justin Meram. The Red Bulls got the lead back in the 24th minute when Derrick Etienne, Jr. scored after being played through the backline by Valot and Kaku. Etienne found himself alone with Orlando City goalkeeper Joe Bendik and was able to beat the Orlando City 'keeper with a clean finish. Just two mintes later, Dom Dwyer tied it for Orlando City, and he gave them the lead with another goal early in the second half, in the 48th minute. Still trailing 3-2 in the 78th minute, the Red Bulls suffered a bad break as outside back Kyle Duncan was forced out of the game due to injury. The Red Bulls had already used all three substitutions, so they had to finish the game with 10 men. The Red Bulls weren't finished by any means, as Aaron Long, on a feed from Mark Rzatkowski, tied the game at 3 in the 82nd minute. 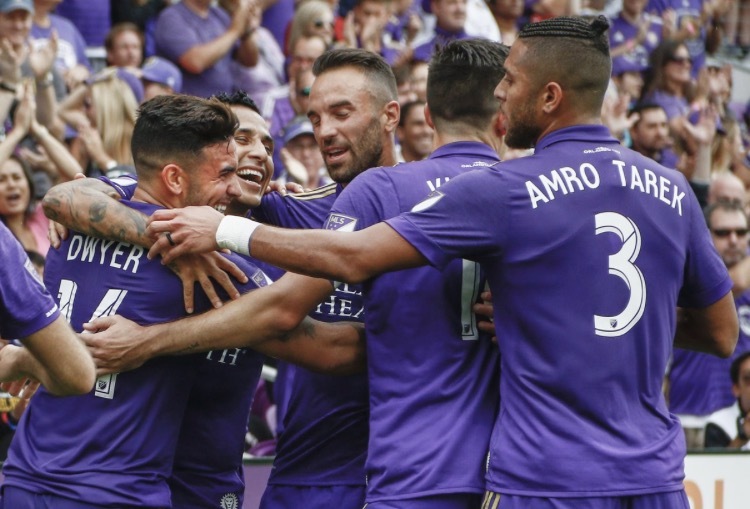 Their hopes for a point were dashed when Josue Colman, assisted by Scott Sutter, gave Orlando City a decisive 4-3 lead in the 86th minute. With Valot, Etienne Jr., and Long finding the back of the net, the Red Bulls have 12 players that have scored at least one goal through eight matches in all competitions. Bradley Wright-Phillips, who appeared off the bench on Saturday, leads the way with six. Offseason acquisition Tommy Redding made his first appearance for the Red Bulls against his former club. Redding joined New York via the trade that sent Kljestan to Orlando. The Red Bulls also had two other former Orlando City SC players in the lineup, with Carlos Rivas and Aurelien Collin joining Redding in the Starting XI. The Red Bulls are now 15-16-9 all-time in the month of March. New York has scored 55 goals in March and allowed 56. The Red Bulls will now break from MLS play for the semifinals of the Scotiabank Concacaf Champions League. The two-legged series against Mexico's Chivas begins on Wednesday night with a match in Guadalajara. Kickoff is set for 10 p.m. ET with the return leg at Red Bull Arena on Tuesday, April 10 at 8 p.m.